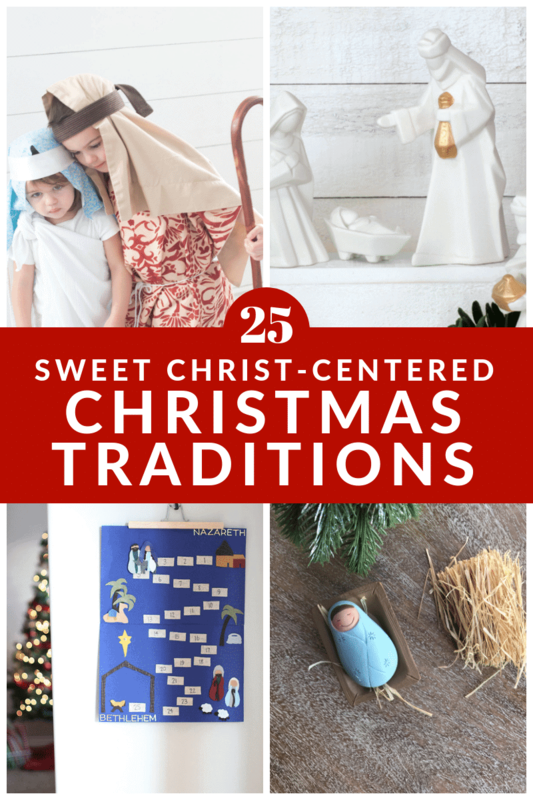 21 Christ-Centered Christmas Traditions - So Festive! Keep Christ in Christmas with these simple Christ-Centered Christmas Traditions Ideas. Please note: This list is not meant to stress you out or make you feel overwhelmed! Sharing these Christ-Centered Christmas traditions list is just for you to get ideas if you’re looking for ways to make Christmas a bit more meaningful for your family. No pressure to do all of them! This tradition came from a reader named Courtney. Thanks for sharing! Instead of giving the normal 12 Days of Christmas, give the 12 Days of Christ! Each day, you can wrap up a small gift that correlates with a name of Christ and the scripture verse where that name of Christ is found. For example, Christ is the Shepherd. For this day, you would give a box of candy canes. There are also companion cards that go along with each tag that describes why Christ is called that name. Not looking for a 12 Days of Christmas Gift Idea? This 12 Days of Christ is not just for a gift. You can use these companion cards for a family lesson or lesson at your church. 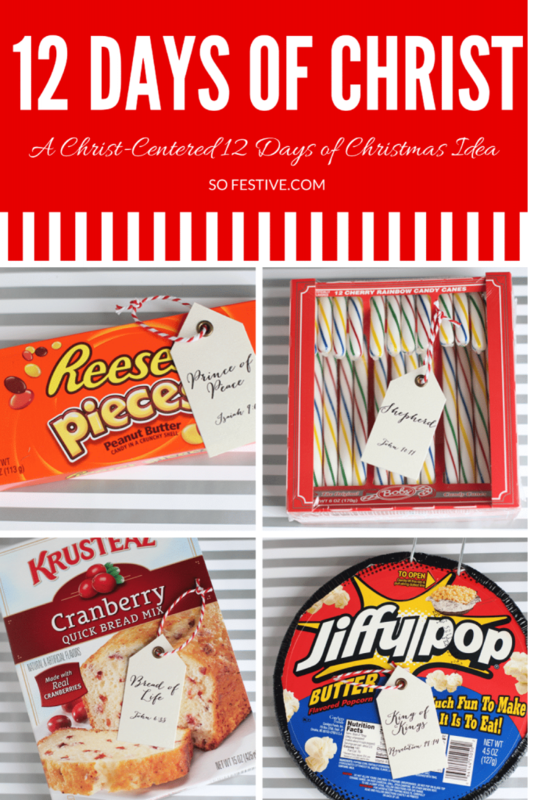 See the full description and printable 12 Days of Christ tags here. There are amazing hand-crafted nativities from around the world that can be displayed at Christmas time. Having nativities in eye-sight will be a constant reminder of what the season is about. Don’t get me wrong, it’s still fun to have Santa and reindeer around, but if you want a Christ-centered Christmas, then try to incorporate spiritual decor in your home. We had a few different advent calendars each year growing up, but one of our favorites was our Nativity Advent. Each day all 7 of us kids would take turns moving Mary and Joseph one step closer to Bethlehem. This was a fun, visual way to remember what was actually happening on the days leading up to Christmas. Get a tutorial for this DIY Felt Nativity Countdown we made a few years ago here. Starting December 1st, gather your family and read a few scripture verses that talk about one of Christ’s character traits. The verses are short and sweet and can be read in under 5 minutes. By Christmas, you will have a greater appreciation for Christ, His life, His miracles, and His Atonement. 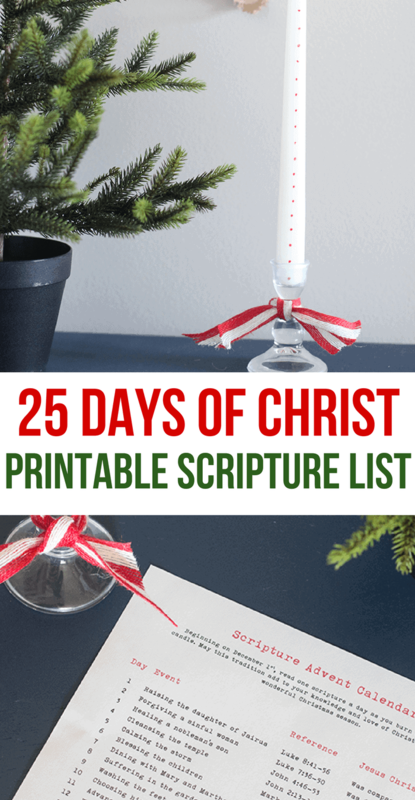 Get the full 25 Days of Christ Scripture Advent details here. My sister planned this festive Bethlehem Dinner for our Christmas Eve dinner a few years ago. She hung up tablecloths from the ceiling and set out the food in baskets. The menu was: chicken and pepper kebabs, oranges, pomegranates, bread (that we broke with our hands) and lentil soup. We ate on the floor and talked dressed up in simple costumes. We usually have a Candlelight Christmas Eve dinner, but this was a fun change and helped us focus on the Savior. We had a wooden manger growing up and throughout December, we would get to put a piece of straw inside whenever we did a nice deed. The goal was to make the bed nice and soft for Jesus by Christmas. This tradition motivates us to do good deeds and serve, but also helps us remember why we are doing those nice things. You can see a simple DIY Hay Manger tutorial here. The Last Straw is also a book about this very tradition if you want a cute way to kick it off! Christmas is Jesus’ Birthday after all, so you could make a cake and sing Happy Birthday to Jesus on Christmas Day. My kids are always drawn to the nativities we have displayed in our home and watch to touch them and move around the pieces. My in-laws gave our children this Little People Nativity a few years ago and it is their favorite! They love rearranging and playing with each piece. And I never have to worry about mine getting broken! Having a kid-friendly nativity will help children focus on Christ throughout the season. Pull out those robes and stuffed sheep and act out the Christmas Story! This fun tradition is perfect for all ages. Acting out the Christmas story will reinforce what happened that special night. It’s tradition to read Luke 2 on Christmas Eve for many, but why wait until Christmas Eve to read it? Try reading the story throughout the month to keep Christ in your mind all month long. Spend a night carving nativities out of soap or make gingerbread manger scenes. These are from a date night my husband and I had before kids. 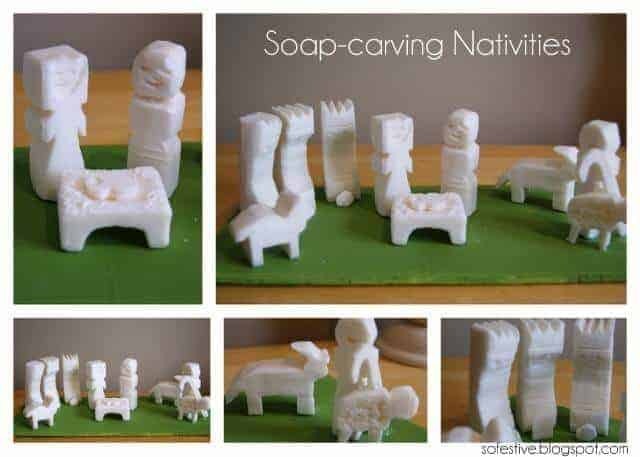 Carving soap nativities is best for older kids and adults! Have you heard of children getting 3 gifts to represent the 3 Gifts the Wise Man brought to Jesus? Implementing this gift rule will reinforce Christ’s birth and help you have less shopping to do. Double win. I came across these cute tags from Happy Home Fairy and think they would be a great addition as you hand out candy canes! 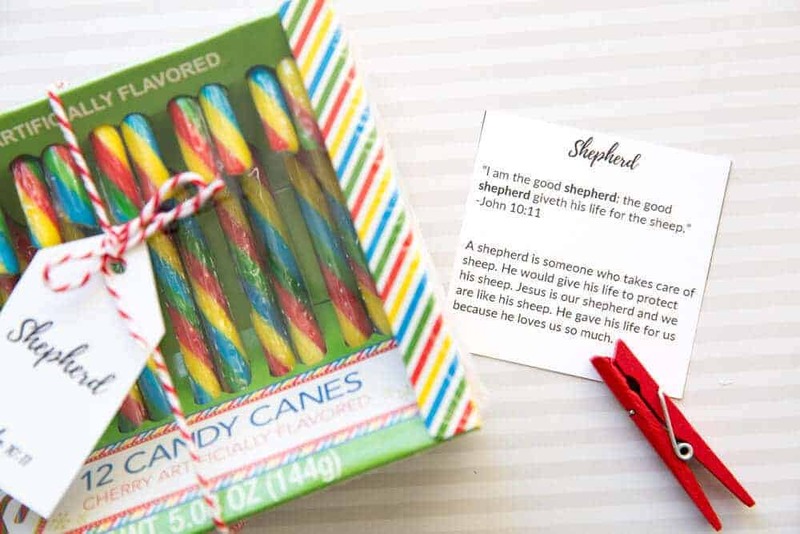 Candy canes represent Christ in so many ways– J is for Jesus, the shape is like a shepherd crook (Jesus is our shepherd) and the red and white represents his atonement. For a fun tradition, keep candy canes on your tree and whenever a guest drops by throughout the season, let them pick a candy cane from the tree! We also love the book: The Legend of the Candy Cane because it reinforces the symbolism of the Candy Cane. There are so many thoughts about Santa at Christmas time. Some are completely against it and others don’t think twice about Christ. We are somewhere in the middle. We like to celebrate the magic of Santa, but make sure we have plenty of Christ-focused activities and reminders. For this reason, I absolutely LOVE the book, I Believe in Santa Claus. We read it early on in the season. It reminds us that all the symbols of Christmas and Santa can remind us of Christ. If you haven’t read it, add it to your list. 16. Go to a Live Nativity or Creche display. Spending some time at a live nativity or creche display will help you focus on Christ. Plus, many of the displays feature Nativities from around the world. It’s so fun (and cultural, too!) to see different country’s representations of the nativity. If you live in Utah, you can check out this List of Nativity Displays on The Complete List of Utah Christmas Activities. There are SO many wonderful Christmas albums to listen to during December, but to remember Christ, don’t forget to listen to calmer hymns about Christ. One of our favorite traditions is celebrating German Advent. I was introduced to this spiritual tradition when I lived in Germany and ever since, we’ve incorporated it into our festivities. Don’t know what German advent is? Read all the details here! Basically, it’s a chance to slow down, focus on Christ and family and enjoy being together. Love it! In a nutshell, we celebrate the 4 Sundays leading up to Christmas by singing Christmas carols, playing hand bells, and eating European Christmas goodies. 19. Participate in the Light the World Challenge! Christ is the Light of the World. By serving and emulating Christ’s example of service and love, we can light the world one act a time. The Church of Jesus Christ of Latter-Day Saints has a really neat initiative going on where each day throughout December, there is a simple way to light the world by participating in a small act of service. The more we serve, even in the smallest ways, the more meaningful our Christmas season will be! There are many fun and free printables on the web that you can use to decorate your house with. 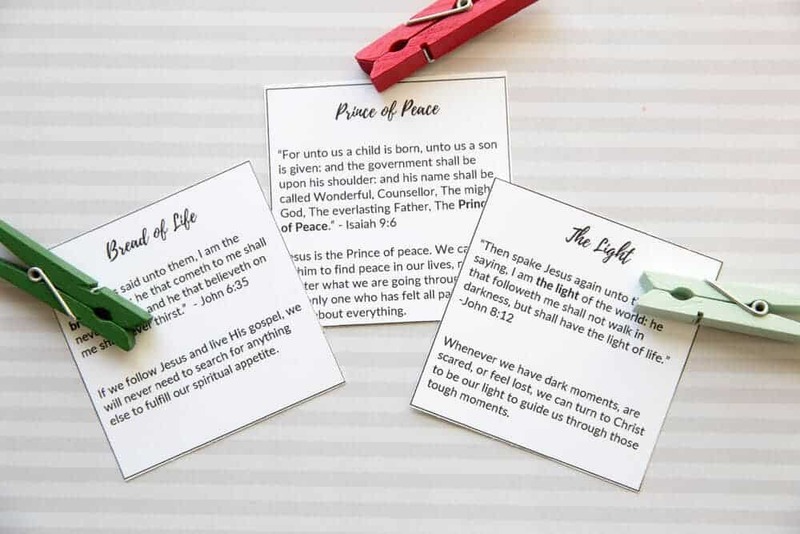 This pin here links up a bunch of free Christ-centered printables you can use this year ! Does the Elf on the Shelf visit your home? We don’t have the Elf come, not that we are against it, but it just seems like one more thing to do! So for now, not having the Elf is one way we have simplified our Christmas season. 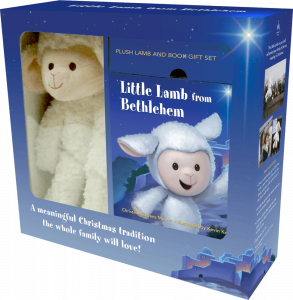 But, if you like that concept, I recently heard of a Christ-centered option called The Little Lamb from Bethlehem. This is not a sponsored post and I have not read the book myself, but the idea seems similar to Elf on the Shelf but with Christ and service as the focus. Maybe a fun option? If you have it or try it, let us know how you like it! Similar to the Gifts to Jesus box, you could hang a white stocking in addition to your family’s stockings. Place your gifts to Jesus in the white stocking on Christmas Eve. Then pull out the gifts the following year and see how you did! 24. Watch Sweet Christmas Movies About Christ’s birth. Now tell me, how do you keep Christ in Christmas? Leave a comment below so we can learn from you! Thank you for sharing all these ideas! 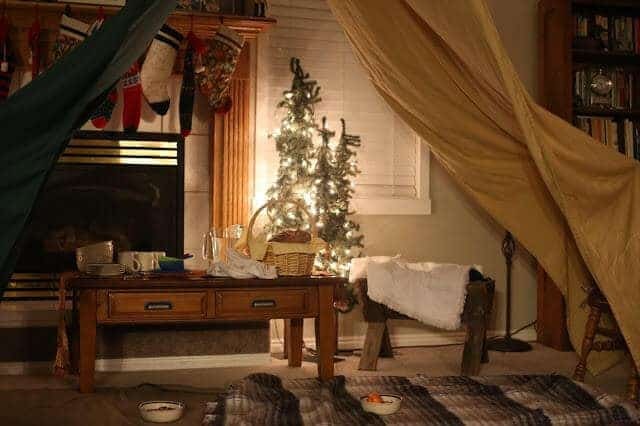 My husband and I struggle with how to do Christmas while our girls (we don’t promote Santa) are so young and this has given me great ideas! I’m so glad I stumbled onto your blog! I’m so glad this list could be helpful! I’d love to hear what ideas you end up doing or if you try any new ones. Merry Christmas!